Beginning in the early 1990s. Bozeman local volunteers began an ambitious process to rehabilitate a local gravel pit into a community park. Working thousands of hours themselves, with some assistance from city, county and state agencies, they turned over the task 'park building' to a fledgling new Rotary Club that just chartered in 1992. Needing a signature community project, the members gladly accepted the challenge and began sculpting, cultivating and renovating the property. With each passing year, as more members joined the club, more and more amenities were added to the park, now officially known as the East Gallatin Recreation Area. One large project was to rebuild the area surrounding the pond so a 'BEACH' was built with sand to attract more kids and families, thus the locals dubbed it 'Bozeman Beach' to help differentiate it from another park near the Gallatin Valley Mall, affectionately called 'Bozeman Pond'. The Bozeman community quickly took notice and appreciated all the new features being added. By 2009, a new restroom and outdoor shower building was added, soon followed by an outdoor patio, volleyball courts, climbing rock, diving and fishing dock. By 2010, more and more community events began being hosted at the Park including triathlons, swim races, winter X-C events, community picnics, and of course, fishing derbys. The Park has enjoyed support from many corporate sponsors, government entities, foundations, businesses and individual contributors, finally culminating in 2014 with the 'burning of the mortgage' celebration by the Sunrise Rotary Club in 2014 (seen below). In early 2019, the State of Montana - through the Montana Fish, Wildlife & Parks department - officially turned over management of the Park to the City of Bozeman under a new 50-year lease agreement, and in the process. 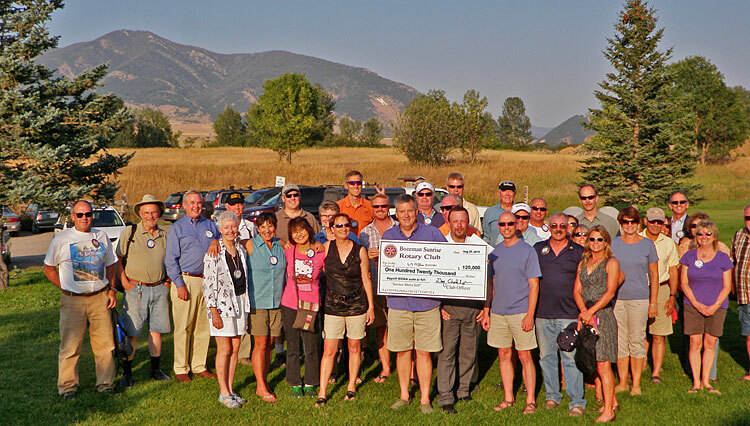 renamed the Park as Glen Lake Rotary Park which was also adopted by the City of Bozeman.